After I made this post I decided to bring the LabVIEW Wiki back online. It was not easy and took several days of server upgrades and hacking. The good news is I was able to bring up all the original pages.. The even better news is I talked with @The Q and @hooovahh and we are all on the same page as to how to move forward. 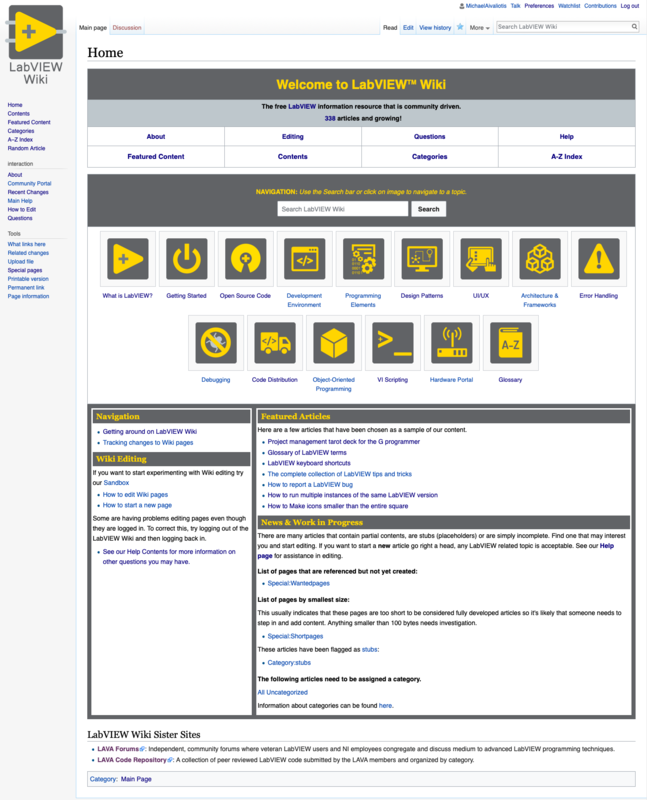 @The Q did a great job of stepping forward and trying to fill the void that the LabVIEW Wiki's absence had left. He's agreed to migrate all the new content he created over to the LabVIEW Wiki, from Fandom and continue to develop new articles and content moving forward on the new site. He will also help in moderating the Wiki and will be promoted to Admin rights on the Wiki. His help is much appreciated. The LabVIEW landing page created here on LAVA is awesome but the forums don't lend themselves to static content creation. Instead @hooovahh has agreed to move the old landing page to here. That will be the new home for the landing page. This will become a valuable resource for the community and I hope all of you start pointing new people in that direction. With many editors, it can only get better and better over time. Logging in. - The old accounts are still there. If you're a LAVA old-timer, then you can try to login using your LAVA username. If the password doesn't work then reset it. You can also create a new account here. I'm going to announce a day when new accounts can be created. I'm limiting it for now because of all the spam accounts that can be potentially created. There's an issue with the current Captcha system. if you are super-eager to start creating content now and want to help, send me a direct message on LAVA and I can manually create an account right away. - New account creation is now open. Permitted content: - I'm not going to put restrictions on content at the moment. Obvious vandalism or offensive\illegal content will not be tolerated of course. However, the guidelines will be adjusted as time goes on and new content is created. There's just not enough content right now to be overly concerned about this. We need content. Discussions about the Wiki. - Each article page has an associated discussions page where you can discuss issues related to that article. Please use that mechanism (same etiquette as wikipedia). General Wiki issues\questions and high level discussions can be done here. So now, if you need to add content, you can do it yourself. Check out the awesome home page updates that @The Q has made. Huge improvement. I love it! I mentioned that I would make an announcement when new account creation will be available. Well, today's the day! I added a google captcha system on the Wiki so it will prevent bot registrations. I think this is working. I haven't seen any spammers for a couple days that it's been running. So if you have the urge to contribute or use the Wiki for your LabVIEW related content, then go right ahead. There's no restriction at the moment to what content is allowed. As long as it relates to LabVIEW in some way and adds some useful information. There will be ongoing editing of course as content comes in. I've made a couple of small contributions to this so far. Mostly clicking on "Random Article" and reviewing it for typos and broken links. I set somewhat of a personal goal of trying to do this at least once per workday. Every little bit helps, right? Granted, they're not contributions on a grand scale yet, (i.e I'm not creating articles, etc.) but maybe I'll get there. This is my first time contributing to a Wiki of any kind, so I'm a n00b at it. Maybe you are not creating articles but general admin akin to what you are doing is the corner stone of a great Wiki and usually goes unrecognised and un-loved. Keep up the good work. Thank you for all of the hours and hard work you folks have donated to make this happen. As others do too, I appreciate your splendid efforts! !